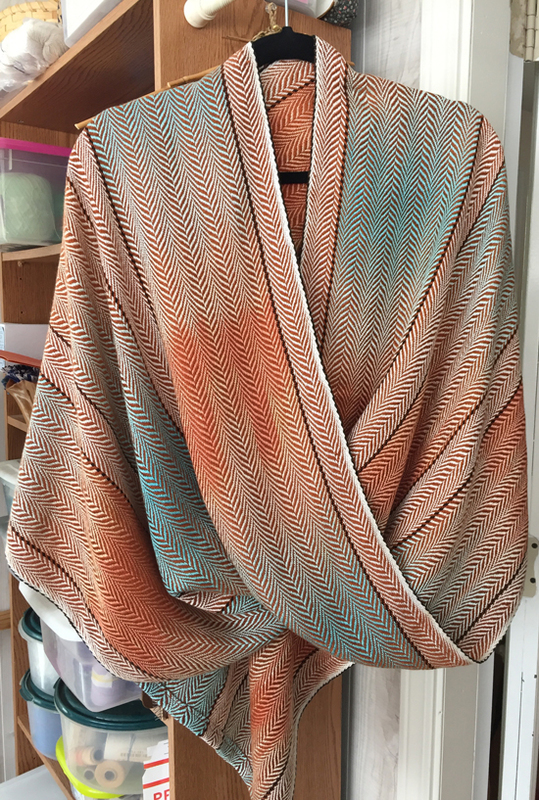 When I painted the first warp bouts in living coral & turquoise, I had intended to combine them with the skeins I painted in the same colors. I later changed my mind, thinking it was just too much. Then I found this great draft on handweaving.net – it’s draft #22076. 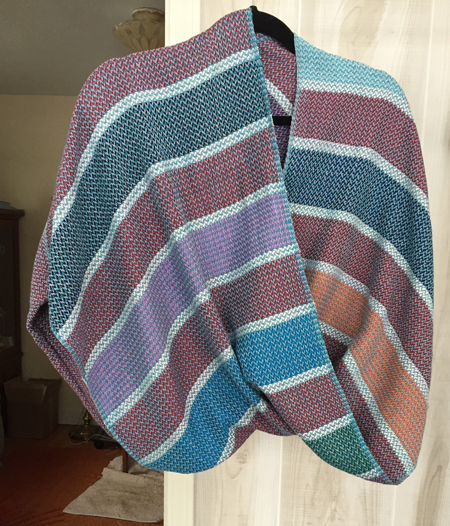 If you’re not a member of handweaving.net, you should be – it’s an amazing resource. There’s no way to really look at how a draft will look with handpainted yarn, as the colors shift in ways the program can’t duplicate, but I did my best estimate, and decided I loved the way the colors interacted if I just added some black and white. With a black weft I got strong hits of zebra. 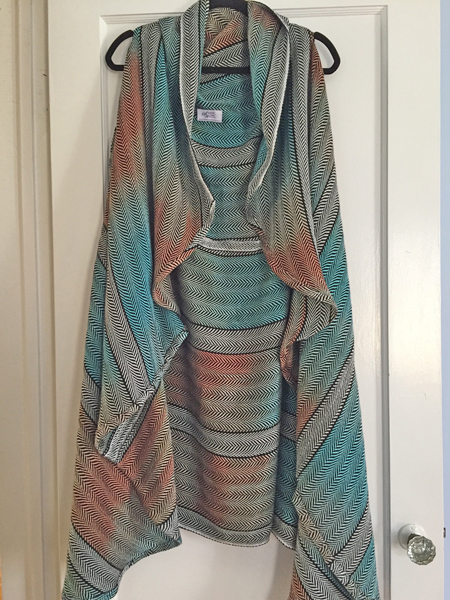 So I wove enough length to make another open front cardigan, planning for this to be one of my new jury photos. I’m quite happy with the overall look, and with the improvements I made from the first one, and will take it to the photographer either today or tomorrow. Lady Jane shows more of the width nicely. The second piece on the loom, a mobius, is probably my favorite because of the weft color. 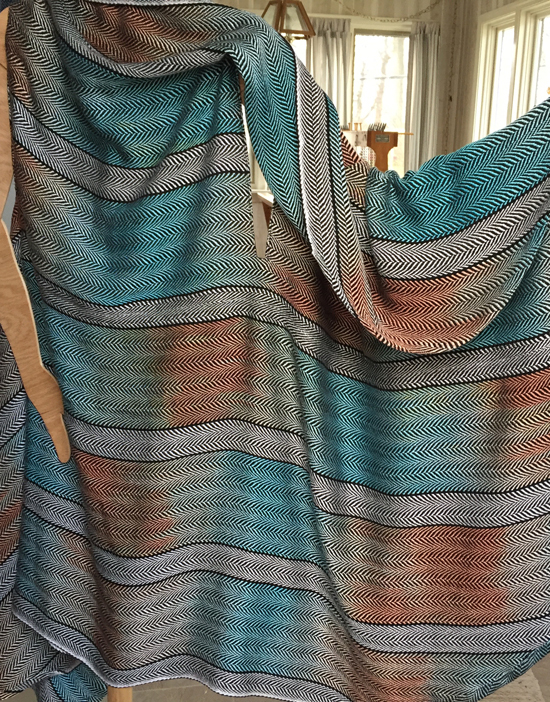 If I’d had enough of this sienna, I would have made the cardi with it. This combo strikes me as very southwest. 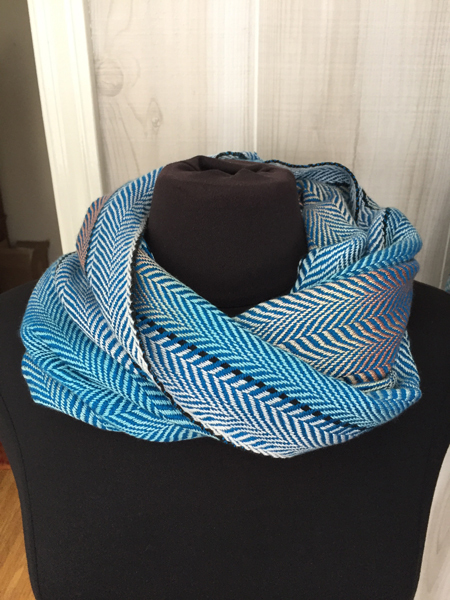 Finally, I had little warp length left, and used a bright blue to weave a wide, if short, cowl. If you look at these photos, and those from the last post with similar warp colors, it’s pretty amazing how different the looks are, isn’t it?! So I still have the coral & turquoise painted skeins. You’d think I might weave with them next, wouldn’t you? But no. I painted some more skeins in new colors – they’re drying now. And while I wait I’m going to put another mixed warp on – cotton, rayon, and chenille – which I’ll weave with a chenille weft. Probably another open front cardigan and a mobius. Unrelated, I think I forgot to show you this mobi. 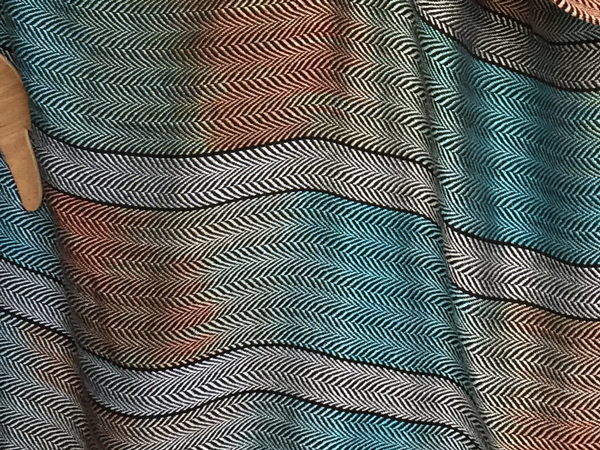 It’s a cotton warp – the end of the warp from that skirt (which I’m still working on) and tencel wefts. Not my fav, but I think it will float someone’s boat. Wow, you may be behind, but I think you’re ahead of the fashion game! Thanks, Alma. We’ll see what others think about the whole fashion thing. I am enjoying the ways you are stretching your talents, creating garments and moving onto a path of greater creativity. Enjoying g your journey! I’ve always been a life-long learner – a term I don’t really like, but a concept that does apply. To you, too!